We’d love your help. 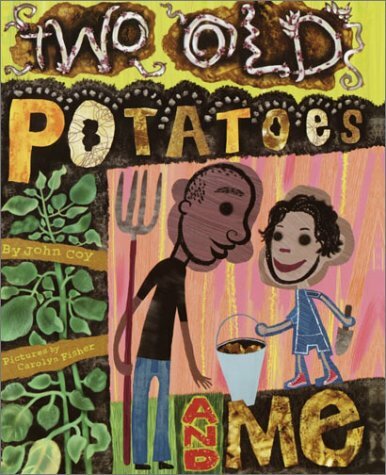 Let us know what’s wrong with this preview of Two Old Potatoes and Me by John Coy. To ask other readers questions about Two Old Potatoes and Me, please sign up. Ever wanted to grow potatoes with your kids? Read this with them! Great father/daughter bonding story where the girl gets to learn how to plant and grow their own potatoes. This actually covers a lot of basic details that impressed me. What I didn't care for so much was the art. Especially the characters (eyes in particular). Too jumbled and just looked sloppy to me. You know it is bad when a few kids in the group you are reading to comment on how they can color better and how the artist couldn't Ever wanted to grow potatoes with your kids? Read this with them! Great father/daughter bonding story where the girl gets to learn how to plant and grow their own potatoes. This actually covers a lot of basic details that impressed me. What I didn't care for so much was the art. Especially the characters (eyes in particular). Too jumbled and just looked sloppy to me. You know it is bad when a few kids in the group you are reading to comment on how they can color better and how the artist couldn't stay in the lines. I am torn about how the story is told. The words are wrapped around the pictures. part of me finds in unique and created. Yet it also seemed to add to the jumbled chaos of the images and the kids have to work and find the next sentence which could add frustration when it throws them off I learned. The art in this one is a love it or leave kind of style, reminiscent of a messy scrapbook. It’s really energetic and makes a rather mundane subject, like growing potatoes, into something a bit more lively and vibrant. 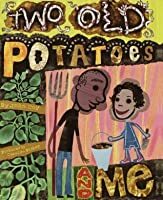 It also really matches the story well, reflecting both the jumble of feelings as the two adjust and Two Old Potatoes and Me is a really simple book about coping with divorce and growing potatoes, making for a cute little story about a father and daughter trying to make new memories. Wow, such disdain for this book's art here on Goodreads! This is crazy talk. The art is amazing, outsider-y (yeah, I know, whatever that means), jumbly and bright and exciting. You need lively art for a story about GROWING BACKYARD POTATOES. Though wait, no you don't. Because the language here is so sprightly and there is ACTUAL SUSPENSE about whether the potatoes will grow. I loved this warm daddy-daughter story (with a casual exchange, "How's your bedroom at your mom's coming?" "Good. Mom and Wow, such disdain for this book's art here on Goodreads! This is crazy talk. The art is amazing, outsider-y (yeah, I know, whatever that means), jumbly and bright and exciting. You need lively art for a story about GROWING BACKYARD POTATOES. Though wait, no you don't. Because the language here is so sprightly and there is ACTUAL SUSPENSE about whether the potatoes will grow. I loved this warm daddy-daughter story (with a casual exchange, "How's your bedroom at your mom's coming?" "Good. Mom and I painted it periwinkle") that would be comforting for kids with newly divorced parents. The anticipation, the illustrations, the "neutral"presentation of a child living with two parents who do not live together, gardening, the idea of using something old and worn out to create something new, cooking, recipes...I could keep going! Making new memories after a divorce can be as simple as growing new life from old roots. This dad and daughter find a way to make a new connection as they plant potato buds and watch them grow and flourish. I really liked this book. It is a simple story about growing new potatoes from old, but the author manages to keep the wonder of the project alive. The story is also a bit bittersweet, because the girl's parents are divorced. However, I appreciate that the author shows a real family structure, rather than the cookie-cutter happy family I usually see in children's books and TV shows. I shuddered at the part where the girl was picking off beetles from potato leaves--"GROSS!" I also like that there is a mashed potatoes recipe at the end. I have never placed nutmeg on mine. I will try this recipe in the future. A young girl wants to throw away 2 old potatoes with lots of sprouts growing out of them. Her father suggests they try planting them. So they dig and plant and water and weed and wait. Eventually they dig up the little plants and under some there is nothing. Under others there are many potatoes. Both father and daughter enjoy their favorite potato: mashed with lots of butter and a pinch of nutmeg for good luck. I love this story. My issue is with the illustrations. The illustrations are curvy and A young girl wants to throw away 2 old potatoes with lots of sprouts growing out of them. Her father suggests they try planting them. So they dig and plant and water and weed and wait. Eventually they dig up the little plants and under some there is nothing. Under others there are many potatoes. Both father and daughter enjoy their favorite potato: mashed with lots of butter and a pinch of nutmeg for good luck. I love this story. My issue is with the illustrations. The illustrations are curvy and all over the page, which is not, in and of itself, a bad thing. However, the overall color of the book is dark: soil, potatoes, dark-skinned characters. It becomes hard to read the dark text. It doesn't pop out at the reader. While visiting her father, a little girl finds two old potatoes at the back of a cupboard. They're so old that sprouts are growing from their eyes and she's about to throw them away when her father stops her and says they can grow new potatoes from the old ones. The story follows them through the growing season as they tend to their potatoes in the garden and eventually dig them up and make mashed potatoes. The story also addresses divorce in a brief and subtle way when the father asks how the li While visiting her father, a little girl finds two old potatoes at the back of a cupboard. They're so old that sprouts are growing from their eyes and she's about to throw them away when her father stops her and says they can grow new potatoes from the old ones. The story follows them through the growing season as they tend to their potatoes in the garden and eventually dig them up and make mashed potatoes. The story also addresses divorce in a brief and subtle way when the father asks how the little girl likes her room at her mom's house. Love how the text is woven into the artwork in most of the pages. Lovely story about some quality time with dad. Her mother and father aren't together...there's a part where the father asks how the room at her mom's house is coming along and about seeing her room on Friday when he comes to pick her up. What I love about it was that it was a feel-good story about a project that a father and daughter go through with finding old potatoes, planting them together, the upkeep during the season, and fi Love how the text is woven into the artwork in most of the pages. Lovely story about some quality time with dad. Her mother and father aren't together...there's a part where the father asks how the room at her mom's house is coming along and about seeing her room on Friday when he comes to pick her up. What I love about it was that it was a feel-good story about a project that a father and daughter go through with finding old potatoes, planting them together, the upkeep during the season, and finishing with feasting on mash potatoes from the new potatoes they grew. Just an overall lovely feeling from this book. This was an interesting story, and hopefully has and will inspire children to plant and grow their own potatoes; or at least try out the mashed potato recipe at the end. The father/daughter discussions and working together were very well depicted. I am not a big fan of this style of illustration by Carolyn Fisher, which reminds me of Chris Raschka's style. But I have to admit that the illustrations worked well with the text. Another one of those books that I have been meaning to read for years. Now that I've read it and see that it's already 10 years old, I am wondering if it's considered a classic. It should be; it's one of those rare picture books that works on so many levels. A beautiful story about a girl and a dad who bond by growing two old potatoes together. Use this one for plant and gardening units,showing that something that looks like junk can be beautiful, or units about families. A pleasant story about a father and his daughter who grow lots of new potatoes from Two Old Potatoes. The bonding that happens between them is inspiring, since the daughter lives with her mom most of the time. Even though the story is appealing, the illustrations are creepy and weird. Kids will find them dark and unappealing. Used for "It's Green and Leafy: Not Trees...Vegetables!" storytime-April, 2010. The story was good but the illustrations were distracting. I felt like the orientation of the words in the book where counterintuitive and would make it difficult to read for an emergent reader. I liked the illustrations but they were in a lot of different colors sort of all over the place and although it did take me a lot of time to scan the pictures to really get an idea of what was going on and there was a lot going on the pictures it was after all somewhat distracting. Oh, how I love this book! The art is amazing, the story is amazing, the hidden meaning is amazing. On multiple levels, this is an excellent book for bonding! It is about a daughter and her father, whom do not live together, and they share the experience of growing potatoes from 2 rotten potatoes that were found in the kitchen.I do not want to give away anything else, you must read this with your children . . . it IS THAT GOOD. This is a charming story about a father and young daughter who have a several-months-long gardening experience together. They grow potatoes in the backyard, with the advice of Grandpa on what to do. After several months, they did up the potatoes and make mash potatoes together (recipe in the back). Really enjoyed reading about the gardening process, and the illustrations throughout the book are a lot of fun! Bravo! A nice (divorced) father and his daughter story in which the two bond over growing their own potatoes. A lot of reviewers didn't like the illustrations, but I felt that they worked with this story. Energetic text and illustrations make this a great introduction to science concepts of the plant life cycle and growing your own food... but there's more. There's a subtle allegory going on, too, of a family that is enduring divorce and reforming as new offshoots. That a little, sparsely-worded picture book can accomplish both with great style rates this as a 5-star feature. This was one of this month's children's GR picture book choices. The story revolved around a fun activity about planting potatoes and how easy it is to do if you just make sure each section has an 'eye'. I did not like the illustrations and found them very distracting. I will give the book to my grandchildren and see where it takes them. They might love it! The illustrations are fun...not my favorite style, but fun and engaging. The story shows a loving relationship between a father and daughter as they use two old potatoes to grow new potatoes. They work together throughout, planting, weeding, watering, picking and then making mashed potatoes. The book includes a recipe for mashed potatoes at the end. This book was selected as one of the books for the May 2014 - Gardening discussion at the Picture-Book Club in the Children's Books Group here at Goodreads. This is a cute story of a girl and her dad who go through all the details of planting, growing, and caring for potatoes - including the gross details like bugs and potato eyes (which give me the creeps). The illustrations weren't my favorites, but they fit the book and story really well. This book does a superb job of putting illustrations and text together. The story is of a little girl and her dad who plant some old potatoes and then care for them over the summer. The end includes a recipe for mashed potatoes that kids could make at home. I initially rated this book as a 3, but as I have read it more, I have liked it more. It is a cute story of a girl and her father growing potatoes from old potatoes. It teaches about growing vegetables and has unique illustrations and text layout. The illustrations, although vibrant and colorful, made it hrs at first to follow the story. Still, this sweet story of a father and daughter learning to grow new potatoes from old inspired us to look for old potatoes of our own to plant. This satisfying story about a girl and her divorced dad who learn how to grow new potatoes out of two old potatoes ends with a recipe for buttery mashed potatoes! Yum! My nine-year-old and I enjoyed "watching" this book on Season 14, Episode 5 of "Reading Rainbow". John has received numerous awards for his work includi John Coy is the author of young adult novels, the 4 for 4 middle-grade series, and fiction and nonfiction picture books. His most recent books are Their Great Gift, a story about immigration with striking photographs by Wing Young Huie and Gap Life, a YA novel about a boy whose parents will pay for college as long as he studies what they want.